Spear Marketing | How many leads do I need to generate to hit my revenue target? How many leads do I need to generate to hit my revenue target? 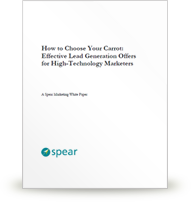 For today's B2B marketer, demand generation planning starts with an end goal. That goal could be net new revenue or a target number of new customers. But how do you translate those objectives into lead goals with which to then scope, plan and design your demand generation strategy? To help, the demand generation experts at Spear Marketing Group have created an online lead calculator based on the SiriusDecisions Demand Waterfall model. Just enter 1) a revenue goal OR a target number of deals and 2) Average Deal Size where indicated, and the form will automatically calculate how many raw inquiries (leads) you likely need to generate in order to meet that goal. The conversion metrics (Inquiry to MQL, MQL to SAL, etc.) shown here are assumptions based on industry averages and our work with B2B clients. If you think any of the actual metrics for your company (for example, your close rate) are different from the assumptions shown, just change that percentage figure as needed. Disclaimer: this calculator is provided for planning and estimating purposes only. Your conversion metrics, and hence your results, may differ significantly. As a best practice, knowing your company's actual "funnel metrics" is a critical ingredient in being able to accurately forecast demand generation ROI and plan demand generation activity of an appropriate scope and scale in order to meet your revenue targets. * Industry standard rates. Adjust as you wish. Spear Marketing Group is a full-service demand generation agency. We help B2B technology companies generate, nurture, and convert leads to revenue using a holistic approach that incorporates strategic expertise, creative flair, and a deep understanding of marketing technology. To learn more about how we can help your company with demand generation strategy, planning, and execution, contact us for a free consultation. "We're extremely happy with Spear in that they've become virtual extensions of our team, helping us execute complex, multi-touch programs on schedule and on budget. Great service, responsive and competitive pricing."